Cryptic enough for you? 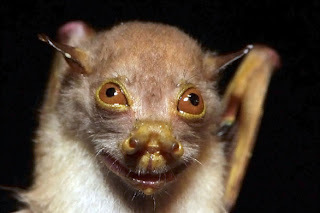 What is this, a chupacabras? A "lost world" was found recently living isolated within a 2,000-year-old extinct volcanic crater in Papua New Guinea. Many new, unique species were found there. View the slide show of the creatures here, the articles here and here, in The Guardian. This reminds us of a previous bunch of new species found in an isolated area in the Foja Mountains, Indonesia, the island of New Guinea. Life is multifarious, highly variegated, always evolving, adapting. The world is more mysterious than we currently know. And then there are forms, like the shark or the redwood, that have lived on in nearly the same form since very ancient times. If the Coelacanth can live, why not a surviving descendant of the old ape, Gigantopithecus? And ask yourself this, if you had no foreknowledge of the panda, which of these two would you find to be a more ridiculous proposition? I mean, pandas are just too teddy-bear-like to believe. How did these things evolve? Keep these facts in mind.... The Giant Panda was not accepted to be a real species by the West until a pelt was brought in in 1869, and a living specimen was not seen by a westerner until 1916. The Mountain Gorilla was not verified until 1902, and before that it was a cryptid, seen as a myth of the local folk by most outsiders. The Bonobo chimp was "discovered" in 1902. The Giant Squid was not seen live until 2005, and thought to be a legend until a dead one was found in 1878. The huge Megamouth Shark was not found until 1976. So, GO FIGURE! Is it really so ridiculous to believe in the Sasquatch as a real, live species? 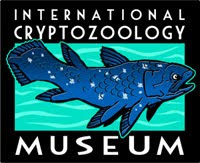 Check out the International Cryptozoology Museum! To explore further: Megafauna Discovered in Modern Times, and CRYPTOZOOLOGY on Wikipedia. As always, check CRYPTOMUNDO.COM for all your cryptic needs. BTW, folks! The word "cryptozoology" is NOT pronounced with a "zoo" in the middle. Check it: krip-tə-zō-ˈä-lə-jē. 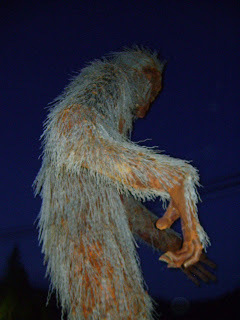 And now, as part of our Regional Roadside Bigfoot Iconography Series, here are some images taken in Happy Camp, CA (read Bigfoot Sightings' great aricle) which is just north from the Bluff Creek area. Happy Camp is a tranquil little hamlet nestled at the bend in the road along Hwy. 96, where the Klamath River starts to head up to the Northeast to its headwaters up in Oregon. This town rivals Willow Creek for its Bigfootiana, including a grocery store, RV park/campground, Bigfoot Towing, a massive metal Bigfoot sculptural monstrosity, and even a wooden Bigfoot statue at the post office. It is also the former home of Java Bob's Bigfoot Deli-Cafe. Java Bob has since moved on along the Bigfoot path with Tom Biscardi's... um... organization. Click Images to enlarge. All Happy Camp images crypto-copyright, as usual, Steven Streufert, 2009. Feel free to use if credit and notice is given. If you're ever in Happy Camp be sure to contact Linda Martin, local researcher--especially if you see something big and hairy lurking in the woods.